Investment in Bonds: is it a good idea? Present economic situation is presenting a hard challenge for bond investors. Yield of government bonds is going down. There is a significant amount volatility is present with bond investment now a days. There is threat of interest rate volatility, longer term infaltion, and ongoing European debt crises for bond investors. This is a very difficult time. However bonds remain a very valuable source of income and diversification available to investors and are part of most investment houses. Thanks to government efforts to strengthen economic recovery by keeping rates low, bond investors are sailing in grey area. Analysts predictions for bond investors are also not in favour of long term investment in bonds. Bond investors need to be prepared for rainy days ahead in future. Governments around the globe are facing challenge for keeping economic recovery stimulus going but they may withdraw any time. What it means that it is a signal for everyone to get out of here. Wall street firms and well known market strategists are giving alarming signals towards investing in bonds. This might be a difficult situations specially for retirees, who often put a major portion of their savings in bonds as safe investment. There are rumours that fed may rise the interest rates in USA. What it means that bond prices will go down. Right now almost kinds of bonds, from government securities to corporate treasury notes are hitting their low peaks. This means that troubling times are ahead for bond investors. For example $1000 invested in 10-year bonds will loose $200 in value for a 2% increase in interest rate. Italian bonds advanced after drooping from a six week high with a 10-year yield bond after the nation met its target amount in a debt auction. We speculate that € will rise in demand versus major other currencies. 10-year bond yield fell 0.05% downt to 4.14% after climbing to 4.23%, the highest since April 19. Italy auctioned 3B € of bonds due in May 2023 at an average yield of 4.14%. However its not that bad. Some countries are doing very good in present times and hopefully will continue doing that. One of such country is Germany. Germany is such a country which is famous for their engineering, hard-working people, honesty and loyalty. 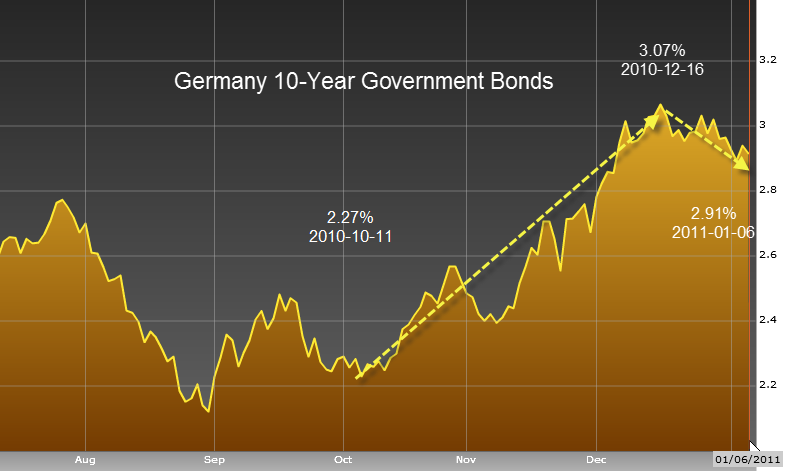 German bonds are known bunds (in Deutsch). Bunds maturity range from 2 to 30 years typically. The German government bunds are considered a gold benchmark in Germany. However European economy is facing a challenge now a days. Germany seem to be a rock stable no matter what happens with other countries in european union. The 10-year bunds yield 1.85 according to Bloomberg. Which is considered to be very good considering current economic situation. Germany maintains AAA rating which is a very good indication about the stability and low volatility for German bunds. German bunds sold off quickly in Jan. During the last twelve months, German bunds yield advanced 0.36 percent. However, the recent downgrade of the United States debt rating and the on-going sovereign debt crisis in the European Union has cast serious doubts into risk-free assumptions for bond-market. German economy grew by approximately 0.1 percent in last quarter after a sharp decline in end of 2012. Recent updates about German economy suggest that there will be modest growth in 2013. In the end it depends on personal risk level. One needs to ask with themselves – Where my money is going? Is it worth investing in that country’s government? How much risk avers am I? Previous Article Previous Article: AMD bouncing back? Next Article Next Article: Apple stock split?